New for April 2014! We have a new page on the evolution of the Lange coupler, thanks to Terry! Here you'll learn how the Lange is similar but different to prior two and four strip couplers. Here's a different way to create a microstrip "3 dB" coupler. We are off to a good start on this ubiquitous microwave component, thanks to Microwaves101 contributor and Hall-of-Famer Julius Lange! Lange couplers are a modern miracle of microwaves. Here is the quadrature coupler at its best: low loss, wide bandwidth, compact layout, and CAD elements good to go. This coupler spawned an entire industry of wideband hybrid-style amplifiers that is still here today in spite of a lot of good competition from MMICs. "In 1969 we at Texas Instruments were building microwave amplifiers on thin film ceramic substrates. We were using the scheme invented by Engelbrecht at Bell Labs, which required 3-dB quadrature couplers. The challenge was to get tight coupling on single layer microstrip. On the other hand our transistors had too much coupling between the interdigitated base and emitter fingers. So why not an interdigitated coupler? I built it; and it did not work well. Then I remembered that geometric symmetry guarantees quadrature, a 90° split between the outputs. So I moved some of the crossovers from the ends to the middle; and it worked! We had a microstrip interdigitated quadrature coupler with low loss and wide, one octave, bandwidth. " Referring to the six finger Lange below, if the bottom left port is the input, the top left is the "coupled" port, the top right is the "through" port and the bottom right is the "isolated" port. You can find the "through" port easily in a Lange because it has a DC connection to the input. The isolated port is on the same side of the coupler as the input for a normal Lange. More about abnormal Langes later! 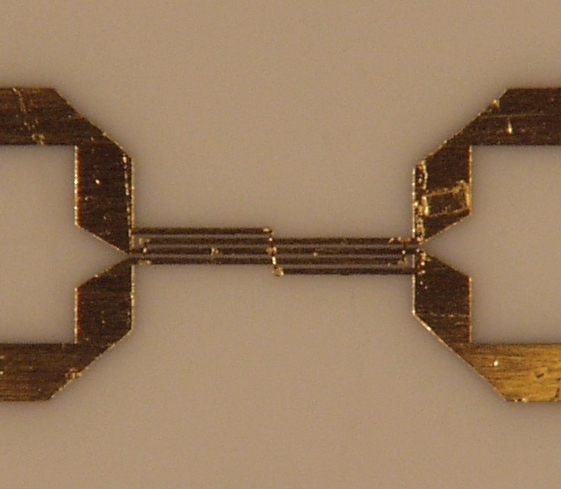 The physical length of a Lange coupler is approximately equal to one quarter-wavelength at the center frequency on the host substrate. The combined width of the strips is comparable to the width of a Z0 (fifty-ohm) line on the host substrate. 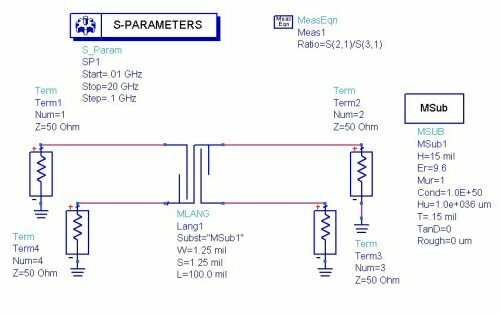 All modern CAD programs for linear simulation of microwave circuits have the capability to model a Lange coupler. Here we will show you an example using Agilent's ADS. The model is shown below: we have chosen to build our Lange on 15 mil alumina. Because the length of the Lange is 100 mils, which works out to a quarter wavelength at 12 GHz, that is the center frequency. We played around with the strip width and gaps until we achieved exactly 3 dB coupling at the center. Widths and gaps of 1.25 mils are considered doable in a good thin-film shop. Below is the response predicted by ADS. For a signal input at port 1, we see a three-dB split at ports 2 and 3. The isolated port gets a signal that is down by more than 25 dB. One more important plot is the phase difference between the output ports. Here is one of the major attractions to the Lange coupler, you won't see such a beautiful quadrature response on a branchline coupler! Now let's play around with the gap dimension. Below are two response, the first one the gap has been increased to 1.5 mils. Notice the coupled port receives less power than the through port. This coupler would be called "under-coupled". The next figure shows what happens when the gap dimension is reduced to 1.0 mils. Now we see an "over-coupled" response. This is often the most desirable case, especially when your application is wide band. 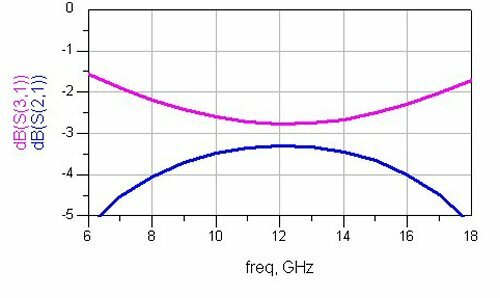 The "coupling error", defined as the difference in magnitude between the two output ports, is less than 1.0 dB from 8 to 16 GHz, an octave of bandwidth. 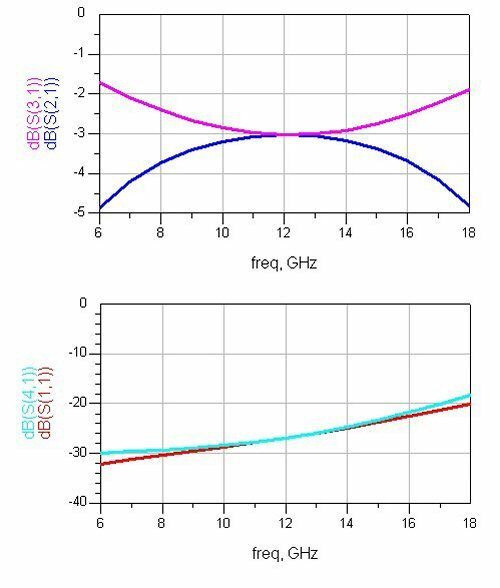 Referring to the first case where exactly 3 dB was achieved at 12 GHz, the coupling error of 1 dB is only maintained from 9 to 15 GHz. Lange couplers have been used from UHF to Q-band, perhaps higher. 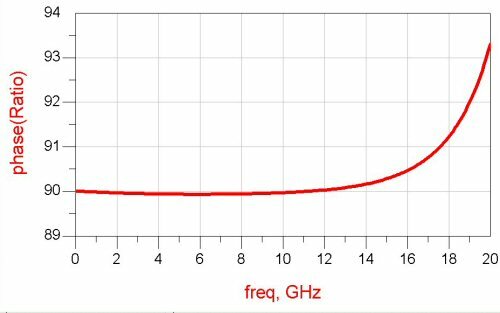 But as you go up in frequency, you'll need to reduce your substrate height to get microstrip to behave (see microstrip height rule of thumb). Reduced height means reduced strip width, which is the ultimate limitation. At some point the strips get so narrow that even if they don't fail your design rules, they will start to become lossy because there just isn't much metal to provide a conductor. 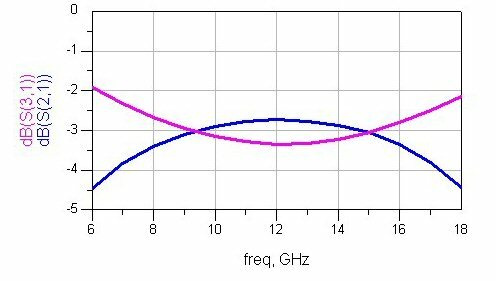 Langes on alumina are usually restricted to applications where the substrate is 15 mils or thicker; this means you'll see alumina Langes operate no higher than 25 GHz. If you attempted to make a Lange on 10-mil alumina, the strip widths would need to be less than 1 mil (25 microns). In MMIC applications, Langes can be made on 4-mil substrates, but it is a fools errand to try to make them on 2-mil substrates. According to our rule of thumb, that means you'll never see a Lange above 80 GHz (four mil GaAs craps out there). If you attempted to make a Lange on 2-mil GaAs, the strip widths would need to be about five microns. Forgetaboutit! Lange couplers have many different layout permutations, some of which have been patented! Four and six-finger Lange couplers are two implementations. Below is a photo of a four-finger Lange coupler on 25 mil alumina. If you look closely you can see four bond wires, which are needed to connect the strips (one on the left side, two in the center, and one on the right side). Some thin-film vendors can make airbridges that will eliminate these tiny bondwires, but you will add some serious money to the fabrication cost. J. Lange, "Interdigitated Strip-Line Quadrature Hybrid", 1969 IEEE-MTT-S International Microwave Symposium, May 1969, pp 10-13.